Twenty eight ramblers, Cath, Frances, Elaine, Jim and Marilyn, Richard, Andrea, Jim, Ken, both Marys, Audrey, Florence, Linda, Jacqui, Susan, Christine Sloan, Steve, Irene, Jack, Peter, Julie and Steve, Sue, Leslie, Allan, Douglas and Christine, assembled in the lay bye at the old Bargrennan Hall. 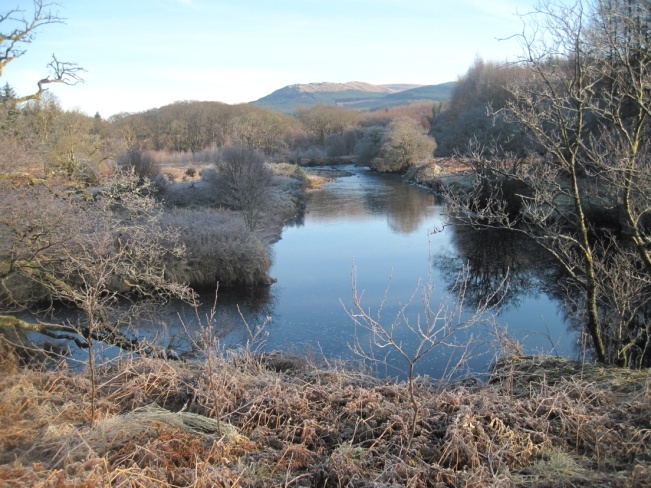 The weather had been cold and misty further south and west but they were greeted by clear skies and brilliant sunshine. 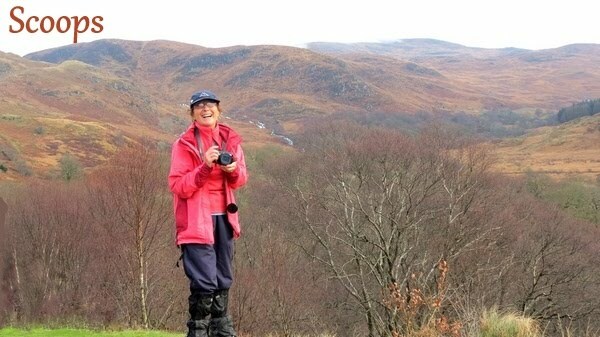 After crossing the main road they followed the Southern Upland Way southwards along the east bank of the River Cree. The water was running quickly with small ice flows eddying their way along. The route soon climbed up into the trees and they were afforded views westwards through the pines to the river and low hills. The mist hung on the tops of the hills but seemed to be making no progress. The track descended slowly and they were soon back at river level at the Clachaneasy Bridge. The group followed the river bank south to the edge of the Brigton Woods where the track turned east and climbed sharply up a small hill through the forest. They soon reached a forest road which led down to the Wood of Cree Road. 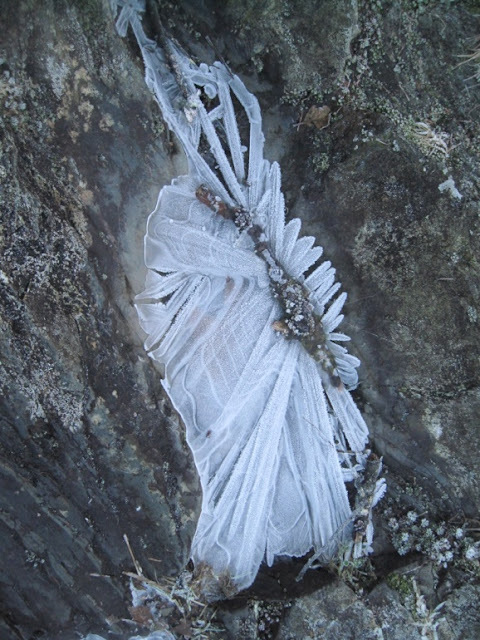 This area proved very slippery as the trees had shaded the sunlight and wide patches of ice remained. After crossing the road they took another forest road heading north. This had recently been repaired and the rough stone surface made uncomfortable walking. Fortunately, this did not go too far and they were soon on a well bedded in surface. 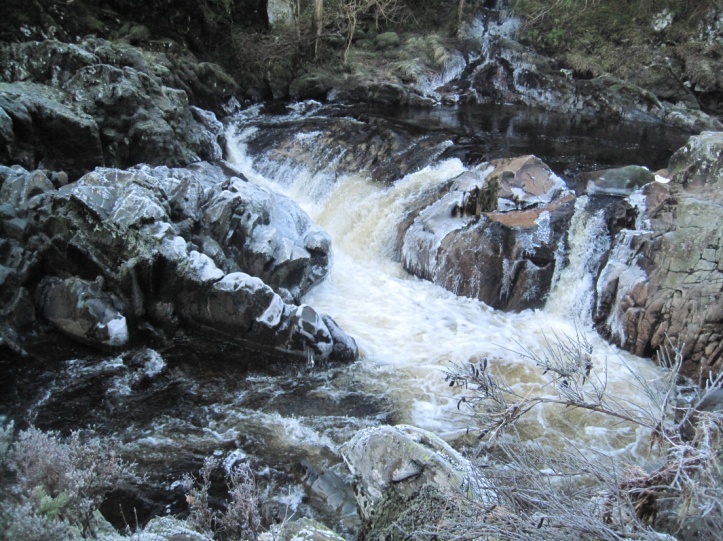 The route then turned off the road and a good path led to the banks of the Water of Minnoch which tumbled down through ice encrusted rocks. The Minnigaff Hills reared above the forest beyond the river with the rocks and ridges standing out sharply against the clear blue sky. After a short pause for jelly babies they carried on northwards following the west bank of the river. After a while the path turned away from the river to avoid boggy ground and climbed around a small oak wood before returning to the river bank. They reached the river at a point shortly above the old pack horse bridge. The group speculated about the reason for siting the bridge there. There is no obvious track leading to either side of the bridge and no centres of population to justify such a substantial structure. Travelling northwards the group climbed a stone stile over a substantial dyke and followed the path through the woods, again turning away from the river. The conifers gave way to old oak woods where there was a dense undergrowth of holly under some trees, presumably the result of mass roosting by birds after they had feasted on the berries. The track wound its way through the wood, rising and falling over a series of low hillocks. The ramblers passed the ruins of Low Minniwick, little more than a rickle o’ stanes but occupied as recently as the early 1900s. They soon reached the Holm Bridge where they crossed the river and continued up the east bank of the river. 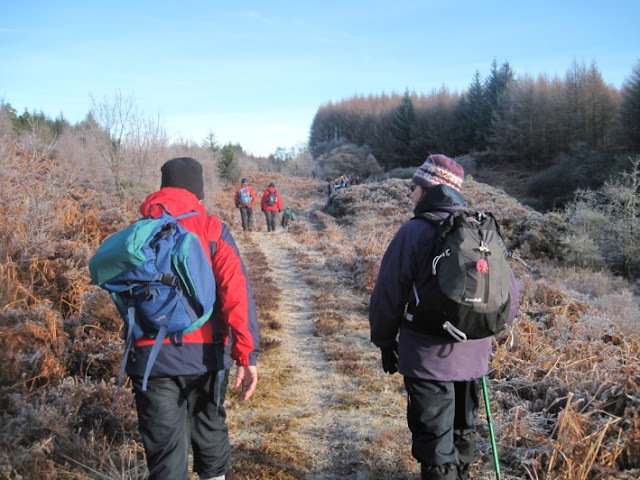 The group followed the Southern Upland Way until they reached the new bridge over the Water of Trool which they crossed and followed the path along the riverbanks to the Forestry Commission visitor centre at Stroan Bridge. Here they took advantage of the picnic tables to have lunch in the sunshine by the rushing river. 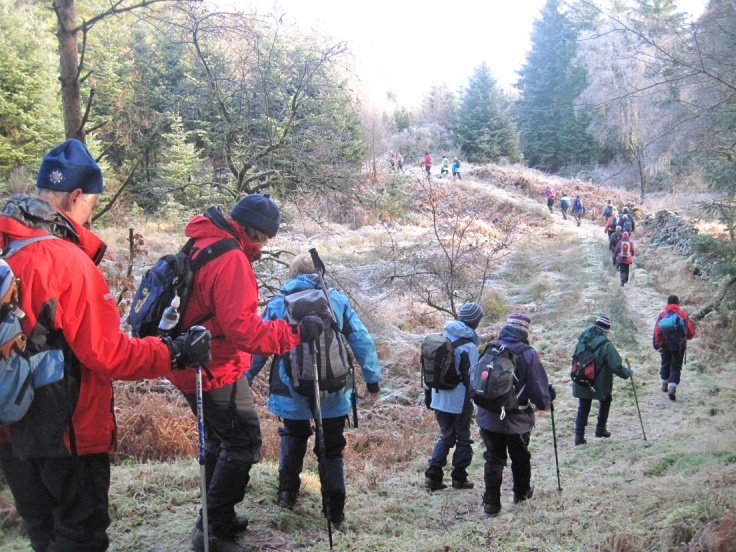 After lunch the group re-crossed the Water of Minnoch by the Stroan Bridge and followed the path through the woods parallel to the county road towards Glentrool Village. They were pleased to see that work was being carried out to fell dead trees along the path and to kill off the resurgent rhododendron growth. This had been very effective and was allowing the native blaeberries to recover under the pines. At the end of the path they followed the forest road to the left which led in a steady climb to the hill above the House o Hill and the old route of the Southern Upland Way. The old route is now completely overgrown so the group continued on the forest road to a T junction where they once again had wide views over the Minnigaff Hills. 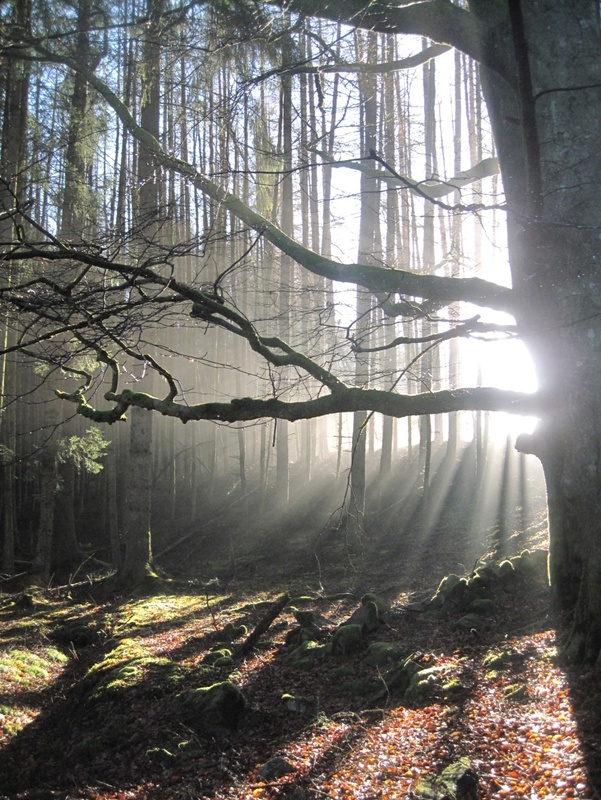 As the sun lowered in the sky it lit tendrils of mist among the trees. The banks of mist on the hills to the west had built up obscuring the summits but had got no nearer. Turning right and then right again they descended towards the river along the forest roads and soon reached the main road and the cars.